Overview: Meet Bat Lash, a well-mannered cowboy in an unmannered West. Bat Lash enjoys the finer parts of life – a succulent meal, a good card game, a fragrant flower, and a pretty woman. Really, he is a pacifist at heart, but he is not afraid to use his guns to protect himself from bandits or the law or sometimes both! Traveling the west on his horse Daisy, Bat Lash can show up in any town and instantly be in a mess of trouble. Sergio Aragonês and Denny O’Neill worked together plotting out the main stories of the Bat Lash book, with superb art by Nick Cardy. As much as I love Cardy’s run on Teen Titans, I am now of the mindset that Bat Lash may be his best work. Why should these stories be Showcased? : I really enjoyed this volume, and quickly breezed through this read. While the Clint Eastwood spaghetti westerns are attributed as the inspiration to for DC to do a new western comic, I was reminded more of the Bret Maverick and James West characters from Maverick and The Wild, Wild West, respectively. In particular, the opening title sequence for The Wild, Wild West (see below) feels like an animated short for Bat Lash. Nick Cardy’s art shines in the Black & White format, well worth the price of this volume. My only complaint is how small this volume is – just 240 pages. 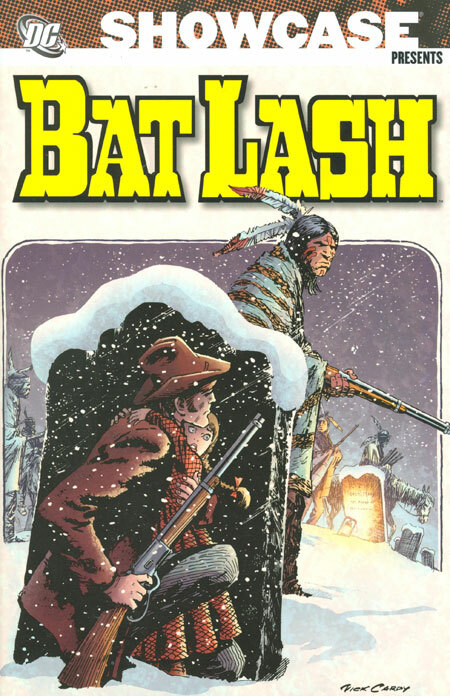 Given the fact that DC included stories from 1978 and 1981, I would have liked to have seen the Bat Lash appearances in Weird Western Tales from that same period included here. If you like this volume, try: tracking down Showcase #100 (May 1978). This has never been reprinted, so you will have to do some searching. For the anniversary issue, writers Paul Kupperberg and Paul Levitz contrived a story of an odd group of heroes teaming up to save Earth from an alien invasion. Those heroes were all characters that had appeared at some point in the first 99 issues of Showcase. So they were able to use the Flash, Green Lantern, Aquaman, Atom, Lois Lane, the Challengers of the Unknown, Adam Strange, Hawk & Dove, the Creeper, and even Bat Lash, as well as many others. This story was drawn by Joe Staton, who in my opinion does not get enough recognition for his work at DC. Not to spoil this awesome read, but yes, the Earth is saved. This is a story that you just sit back and enjoy, and forget about continuity, in particular how characters from the past (Bat Lash) are interacting with current characters and even future characters (Tommy Tomorrow, Space Ranger). This is a true gem from DC’s Bronze Age. This entry was posted in Bat Lash, DC Showcase Presents and tagged Bat Lash, Dan Spiegle, Denny O'Neil, Len Wein, Nick Cardy, Sergio Aragones. Bookmark the permalink.